Continuing from yesterday's entry, we set off for KenTing the day after for a family retreat. En route, we decided to stop over at Dong Gang (东港) fish market for lunch. It is essentially a fish wholesale center where you get the freshest catch of the day. Once you have bought your seafood, you bring it to the hawkers next door who will cook your seafood for you, for a nominal service charge. It was a quiet day as it is winter and no longer the peak vacation season. A separate group of Hong Kong folks and us were the only tourist there that day. 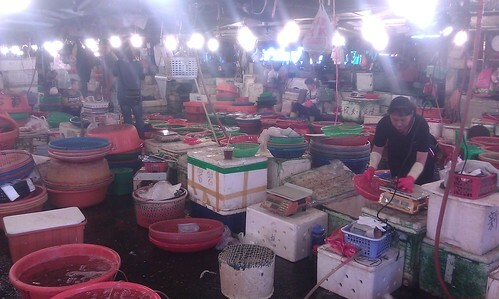 The place as you would imagine is how a wet market should be. Wet, dim and stinks. Exactly how a fish market should be. In return, we get the fresh seafood at the cheapest prices. No complains there! I like the quiet and laid back charm of the place. Yes, it smells terribly like how all fishing ports should smell. Stray dogs patrolling the area just adds to the finishing touches to a rustic painting. Quite a coincidence that the place you're driving to is called KenTing... and the road trip is so long you have stopovers, just like when we drive to Genting here. Any other similarities? 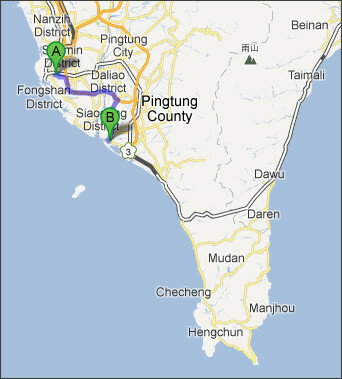 Kenting and Genting. One is sea side, the other is mountain top.